The goals and purposes of this breed standard include: to furnish guidelines for breeders who wish to maintain the quality of their breed and to improve it; to advance this breed to a state of similarity throughout the world; and to act as a guide for judges. Breeders and judges have the responsibility to avoid any conditions or exaggerations that are detrimental to the health, welfare, essence and soundness of this breed, and must take the responsibility to see that these are not perpetuated. The tendencies toward exaggeration and steep angles are unacceptable. German Shepherd Dogs with unstable temperaments, sharply angulated croups, overly long front and rear pasterns, and hocks that are weak and wobbly are poor representations of this working breed. UKC is unwilling to condone the validity of using exaggerated specimens of this breed in a breeding program and, to preserve its health and vibrancy, cautions judges about awarding wins to these representatives. The German Shepherd Dog is a relatively young breed, developed almost single-handedly in the first half of the twentieth century by a German cavalry officer, Max von Stephanitz, president of the Verein far Deutsche Schaferhunde S.V. Using a variety of German sheepdogs as his foundation stock, von Stephanitz developed a distinctive breed in a very short period of time, due in large part to the authoritarian practices of the German dog fancy at that time. Von Stephanitz emphasized utility and intelligence in his breeding program, enabling the German Shepherd Dog to switch easily from herding duties to other fields of work, particularly military and police work. The breed was just gaining notice in the United States when World War I broke out. All things German were shunned and popularity slumped. After the war, however, movie star Rin-Tin-Tin stimulated interest in the breed again. The striking good looks of this breed, combined with its remarkable intelligence and loyalty, have made it a favorite working and companion dog. The German Shepherd Dog was recognized by the United Kennel Club in 1924. The German Shepherd Dog is a medium-sized, well-balanced, muscular dog, slightly longer than tall, with a medium length coat, erect ears, and a low-set natural tail that normally reaches to the hock and is carried in a slight curve like a saber. The outline of the German Shepherd Dog is made up of smooth curves rather than angles. The head is in proportion to the size of the body, strong without appearing coarse or fine. Gender differences are readily apparent. The German Shepherd Dog should be evaluated as an all-around working dog, and exaggerations or faults should be penalized in proportion to how much they interfere with the dog’s ability to work. The German Shepherd Dog is confident and fearless, willing to be approached, yet a certain level of aloofness towards strangers is acceptable. When working, the German Shepherd is alert and eager, adapting well to new tasks. Lack of confidence is a serious defect in the character of a German Shepherd. The structure of this breed was designed for efficient locomotion, particularly at the trot, so poor movement is another serious fault. The head is proportional to the size of the dog, and cleanly chiseled. Males should appear masculine without coarseness; and females feminine without being overly fine. The skull and muzzle are of equal length, parallel to one another, and joined at a very slight stop. There is little or no median furrow. SKULL - The skull is broad and only very slightly domed. In males, the skull is slightly wider than it is long; in females, the skull is slightly narrower. Viewed from the front, the skull tapers evenly from the ears toward the muzzle. The cheeks are just slightly rounded but do not protrude. MUZZLE - The muzzle is long and wedge-shaped, with strong, well-developed jaws. In profile, the bridge of the muzzle is straight and parallel to the topline of the skull. Lips are tight and darkly pigmented. Faults: Muzzle too short, blunt, weak, pointed, or overlong. TEETH - The German Shepherd Dog has a complete set of evenly spaced, white teeth meeting in a scissors bite. Faults: Overshot or level mouth; missing first premolars. Serious Fault: Missing teeth other than first premolars. NOSE - The nose is always black. Disqualification: Nose not predominantly black. EYES - The eyes are as dark as possible, of medium size, almond-shaped, and set slightly obliquely. Expression is alert, calm, and intelligent. Eye rims are dark. EARS - Ears are erect, moderately pointed, of medium size, broad at the base, and set high. Ear leather is firm. When the dog is alert, the centerlines of the ears, viewed from the front, are perpendicular to the ground and parallel to each other. Disqualifications: Cropped ears; drop or tipped ears. The neck is relatively long but strong and muscular. The skin is tight. The German Shepherd Dog normally carries the head just a little higher than the shoulders, particularly when moving. The shoulder blades are long, well muscled, well laid back, and laid flat to the body. The upper arms, also long and well muscled, join the shoulder blade at nearly a right angle. A straight line drawn from the withers to the ground should pass just behind the back of the foreleg. FORELEGS - From the pasterns to the elbows, the forelegs are straight and strong with oval-shaped bones. The pasterns are strong and supple, sloping no more than 25 degrees. The elbows are neither close to the body nor out, but are set on a plane parallel to the body. The length of the forelegs should be just slightly more than half the height of the dog, measured at the withers. Serious Faults: Pasterns slanted more than 25 degrees. Pasterns so long and weak that proper movement is compromised. 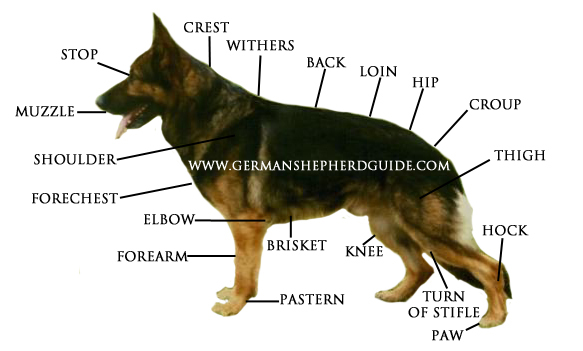 A properly proportioned German Shepherd Dog is longer (measured from prosternum to point of buttocks) than tall (measured from the withers to the ground) in a ratio of 10 to 9. The length is derived from proper construction of forequarters and hindquarters and not from length of back. The line of the back slopes downward from the withers into a straight, strongly developed, and relatively short back. Ribs are long and extend well back, resulting in a short, broad loin. The croup is long and slightly sloping. Viewed from the front, the chest is deep and well filled. From the side, the forechest extends in front of the forelegs and the brisket down to the elbows. Tuck-up is moderate. Faults: Barrel ribs; ribs too flat; long loin. Serious Faults: Any measure of a roached back. Shelly appearance. Viewed from the side, the hindquarters are broad and muscular. The angulation of the hindquarters is in balance with the angulation of the forequarters. The rear pastern is short and strong, and should remain upright and functional. Powerful hindquarters are necessary to enable the effortless movement that is an essential feature of this breed. Rear pasterns should remain upright and functional. Serious Faults: Over-angulated rear, with anything exaggerated beyond a mild slope. Rear pasterns so long and weak that proper movement is compromised. Feet are round and tight, with toes well arched. Pads are thick and hard. Nails are strong and dark. Front dewclaws may be removed but are normally left intact. Rear dewclaws, if any, are removed. The feet should recoil cleanly from each stride. Serious Fault: Feet that drag along the ground on recoil. The tail is set on low in a natural extension of the unexaggerated, slightly sloping croup. The tail extends at least to the hock joint. When the dog is relaxed, the tail hangs in a slight curve, like a saber. When the dog is excited or moving, the tail may be raised and the curve accentuated but the tail is never carried above a vertical line extending from its base. The coat on the tail stands outward, giving the tail a bushy appearance. Faults: A slight hook in the tail to the extent it mars the dog’s general appearance. Serious Faults: Tail too short; ankylosis. The German Shepherd Dog is double coated. The outer coat lies close to the body and is dense and straight with harsh texture. A slight wave is acceptable in a particularly harsh coat. The undercoat is short, dense, and fine-textured. The coat on the body is of medium length but not so long as to detract from the dog’s ability to withstand bad weather conditions. The coat is shorter on the head (including the inside of the ear), the legs, and the feet. The coat on the neck is longer and thicker, forming a slight ruff, particularly on some males. The hair on the back of the legs is longer and thicker, forming trousers on the hindquarters, and extending to the pasterns in front and the hock joint behind. Serious Faults: Short, mole type coat; long coat that stands away from the body; soft coat; absence of undercoat. The German Shepherd Dog comes in many colors and white. In evaluating colored dogs, strong, deep colors are preferred. Nose, lips, and eye rims must have dark pigment, regardless of coat color. Color faults are minor in comparison to defects of type and structure. Serious Faults: Pale, washed-out colors; blue; liver. Desirable height at maturity for males is 24 to 26 inches; for females, 22 to 24 inches. Absolute soundness of movement is paramount. Correct gait is an essential feature of the German Shepherd Dog. When trotting, it moves with a long, effortless, efficient stride that is driven by a powerful forward thrust from the hindquarters. The rear leg, moving forward, swings under the foreleg and touches down in front of the point where the forefoot left an imprint. The result is that one rear leg passes outside its corresponding front leg and the other passes inside its corresponding front leg. This is a breed characteristic and should not be penalized as long as the body is straight in relationship to the direction of movement. As the rear leg moves backward, the body is propelled forward. The front and rear feet remain close to the ground throughout. When trotting, the back remains firm and level with no superfluous vertical movement. Hocks should be strong and straight, turning neither in nor out as the dog moves. There should be no visible “wobble” to the hock. Neither front nor rear pasterns should strike the ground; this is an unacceptable exaggeration and an indication of incorrect movement. As the speed of the trot increases, there is a tendency to single track. Correct movement and soundness must be evaluated from front and rear as well as the side. Serious Faults: Any fault that affects correct movement. Unilateral or bilateral cryptorchid. Viciousness or extreme shyness. Albinism. Undershot. Wry mouth. Nose not predominantly black. Cropped ears. Drop or tipped ears. Docked tail. Content copyright to the United Kennel Club. All Rights Reserved.